The Orient-Express remains today the first and most famous train of Compagnie Internationale des Wagons-Lits (CIWL), linking Paris to Vienna and Istanbul, crossing borders in central Europe. In 1869, Georges Nagelmakers, a young Belgian engineer, travelled through America and discovered the first sleeping cars, invented by George Mortimer Pullman. Back to Europe, he managed to sign the international contract giving Compagnie Internationale des Wagons-Lits the exclusive right to circulate between Paris and Vienna in 1874. On October 1882, the first train (Train Eclair) linked the 1350 km from Paris to Vienna in 28 hours. The fist regular train was called Express d'Orient and was inaugurated on June 1883, with 4 rotations per week between Paris and Constantinople (Istanbul), via Strasbourg, Munich, Vienne, Budapest et Bucarest. In Giurgiu (Romania), the crossing of the Donau to Bulgaria was done on a ferry. Then a second train went to Varna on the black sea. From there, a steamship would take the passengers to Constantinople in 14 hours. In 1885, a train left everyday to Vienna and in 1889, the rail tracks went all the way directly to Constantinople. The name 'Orient Express' was adopted became the official name of the train in 1911. The same year, it was attacked in the Balkans: 120 000 British Pounds were robbed, including a ransom for 5 hostages. The next year, the train was put in quarantine for an epidemic of cholera. Compagnie des Wagons-Lits (CIWL) opened hotels for Orient Express passengers in Constantinople and in various capitals of Eastern Europe. In 1898, a gala dinner was organized in the Pera Palace in Constantinople to celebrate the 25th anniversary of CIWL. 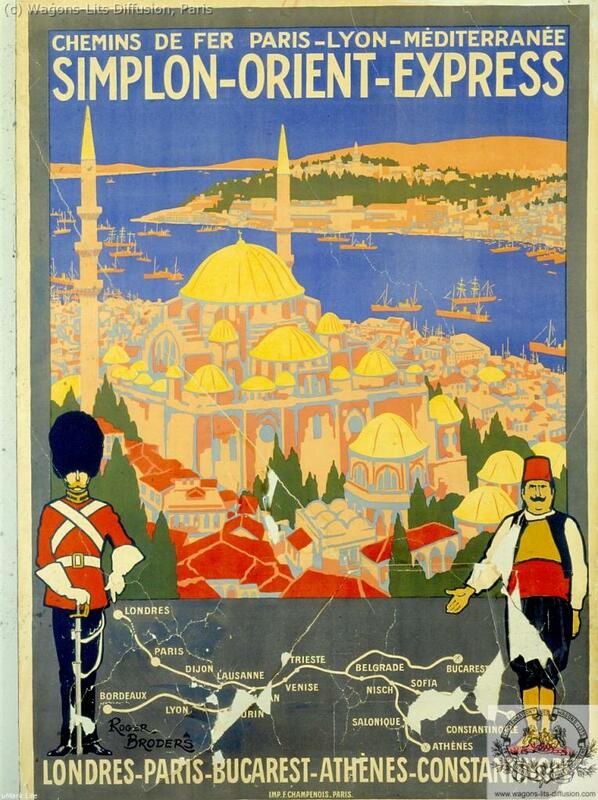 In 1913, because of the Balkan wars, the Orient Express stopped in Belgrad. In 1914, CIWL operations in Europe were mostly stopped, and CIWL rolling stock was nationalized by the German Empire in Eastern Europe. In 1916, Germany created MITROPA to replace CIWL in their territories and launched the Balkanzug as a German version of the Orient Express. Mitropa was a symbol of the creation of Mitteleuropa, a vast economical and political region of nations allied with Germany in Eastern Europe and controlled by Germany. As another symbolic gesture, Marshall Foch signed the Armistice of WWI on November 11th 2018 on board CIWL restaurant car n°2419 in Rethondes near Paris. This car, later called 'la voiture de l'armistice' was lent by CIWL to the French army to serve as personal office wagon for Foch. Orient Express service resumed in 1919 as a military train for allied forces. WL / PLM Poster for the SOE in the 1930's. On April 1919, a new CIWL train service was opened through Italy, thanks to the opening of the Simplon tunnel : this new train, named 'Simplon Orient Express' left Calais-Maritime (with a correspondance train service from London) for Paris-North station and Paris-Lyons station. 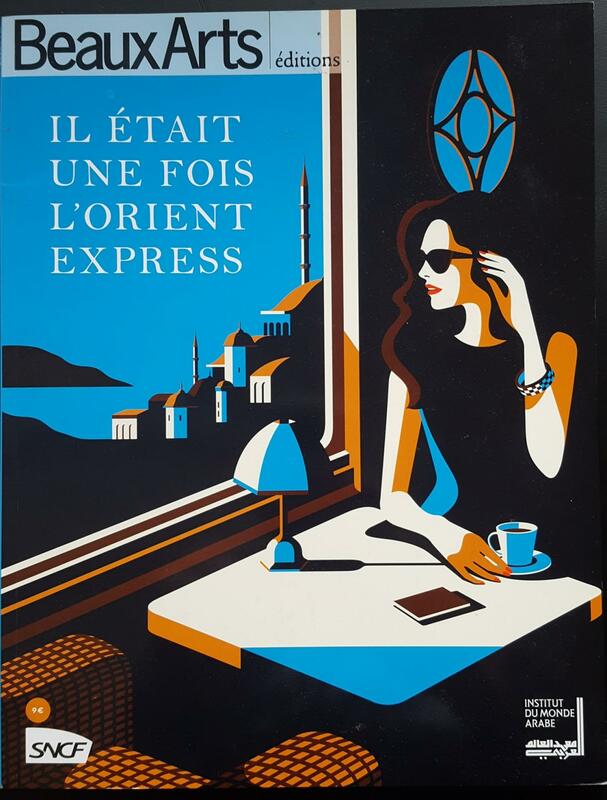 The Simplon Orient Express went to Istanbul and Athens via Lausanne, Milan,Verona, Venice, Triest, Zagreb, Belgrade, Sofia and Salonique. This route which avoided Germany soon became more important than the original Orient Express route through Vienna. 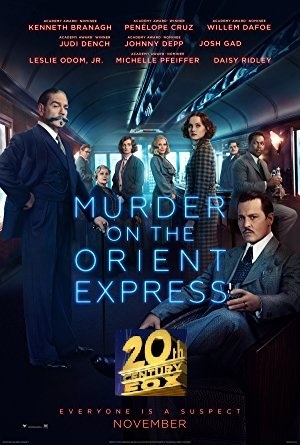 The Action of Agatha Christie's novel, Murder on the Orient Express, takes place in the Simplon Orient Express, from Istanbul to Calais. Arlberg-Orient-Express from Calais and Paris toward Athèns via Basel, Zurich, Innsbruck and Vienna. Ostende-Vienne-Orient-Express toward Istanbul via Amsterdam, Bruxelles and Bucarest, in which author Graham Greene locates his novel Orient-Express. Tauern-Orient-Express between Berlin and Istanbul via Munich, was inaugurated by Compagnie des wagons-lits' rival, Mitropa. In January 1923, when the Rhur valley was invaded by French troops, Germany interrupted the Orient Express service on its territories as a retaliation. In 1924, confortable Pullman coaches were put in service by CIWL from London to Dover (later called the Night Ferry), with a correpondance with the Malles des Indes and then the Simplon Orient Express in Calais. In 1928, CIWL took control of the famous 'Thomas Cook Travel ' company, which had a important activity in tourism in all English speaking countries. 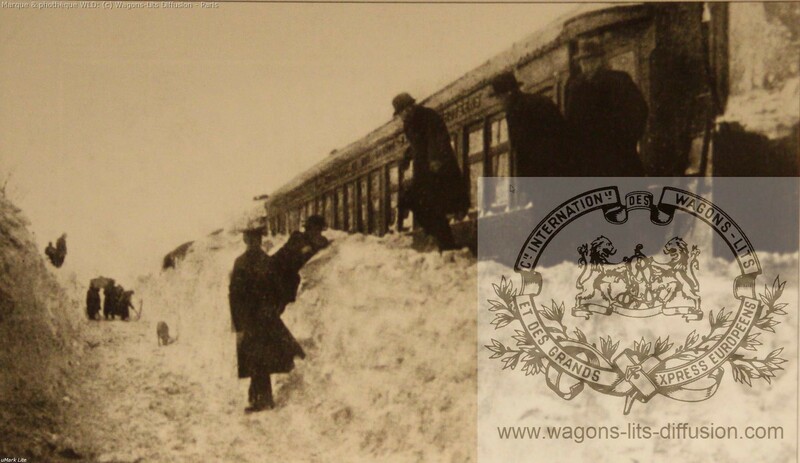 In 1929, the Orient Express was blocked by a snow storm near Istanbul. After 5 days blocked in the snow, passengers had to kill wolfes for food. This adventure inspired Agatha Christie for a novel 'Murder on the Orient Express'. In 1930, a new line, the Taurus Express, was started on the Asian border of Istanbul, from Haïdar-Pacha to Bagdad and Bassora (with a maritime correspondance to India). More rapidly than by boat, the Simplon-Orient Express + Taurus Express allowed to reach Egypt, Palestine and further East, travelling in the most confortable conditions. In September 1931, a group of terrorists blew the Biatorbagy in Hungary. One sleeping car of Orient Express fell in the river with the locomotive, derailing the whole train. 20 people were found dead. Famous singer Josephine Baker was on the train and helped the rescue team. The main terrorist was later hanged. In 1932, the line between Munich and Stuttgart was electrified. In 1936, the launching of the Night Ferry from Paris to London, allowed to cross the Channel without changing train, thanks to new specific sleeping cars of CIWL, which were embarked on the ferry. Passengers could then board the Orient Express in Paris. In 1939, Germany took all CIWL coaches in Austria and in the Eastern countries. CIWL stopped all services. Only Mitropa continued in German occupied countries from Munich and Zurich. The myth of the Orient Express is still present in the public all over the planet, thanks to many books published each year, using CIWL's important database of archives photos (license WLD). Also, CIWL and Wagons-Lits Diffusion have organized with important European museums a series of major public exhibitions. These exhibitions have all enjoyed a tremendous success with public. Still today, a number of ex CIWL rolling stock have been restored and kept in many museums, private places or entertainment activities. Only 2 complete CIWL trains bearing the name Orient Express are in circulation: the Venice-Simplon Orient Express (VSOE) and the Pullman Orient Express (POE). They have been carefully restored in the original luxury train configuration by CIWL workshops in the 1980's. Theses trains are composed of mythical LX Sleeping cars (only VSOE), Pullman Salon cars and restaurant cars, magnifically renovated as they originally were in the 1920's. Their external liveries proudly show the classical Blue and Gold colors with Golden Lions in a Golden crest, symbol of CIWL. It has to be noted that none of all these restored coaches has ever actually served on the Orient Express line, but on other CIWL services in Europe. -Venice Simplon Orient-Express (VSOE), belonging to Belmond Hotel Group, (now part of LVMH since 2018). -Pullman Orient-Express (POE), has been restored and operated directly by CIWL since 1987. It was sold to SNCF in 2012. Note: Whenever CIWL sold renovated CIWL coaches to third parties, these coaches keep the authorization to show the Golden crest with 2 lions, as well as the full name CIWL. This authorization is granted only for luxury train services, but the logo cannot be used in anyway for any other commercial activity without a contractual authorization from Wagons-Lits Diffusion. Graham Greene's novel Orient Express (original title in English 'the stamboul Train') and 'Travel with my aunt' both take place on the Orient Express. The most memorable scene from Onze Mille Verges by Guillaume Apollinaire takes place on the Orient Express, taking Prince Vibescu from Paris to Bucarest. The creator of James Bond uses Orient Express as a key decor for intrigue of From Russia with love. How to Organize a CIWL Exhibition?